Jumping rope, or skipping, is a simple but super effective way to get and stay fit and control your weight. If you are looking for a no-frills way to exercise, maybe something you can do at home or when you’re on the road, or simply an indoor workout when the weather is bad, look no further than jumping rope. Jump ropes are cheap, easy to find and hard-wearing. 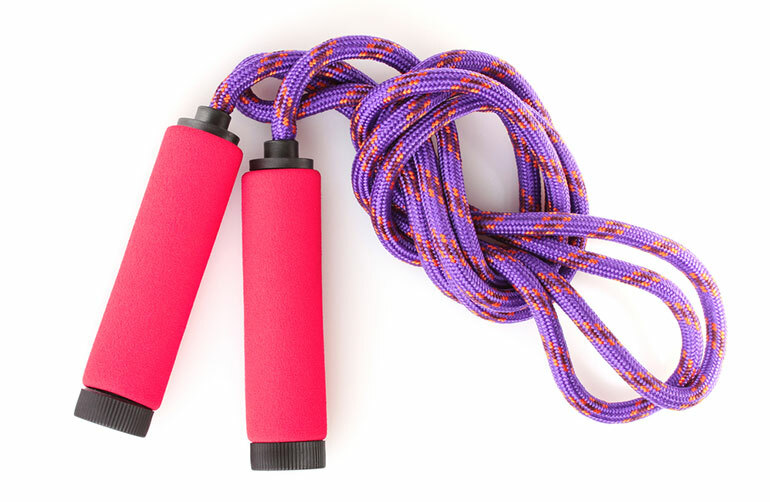 For $20.00 or less, you can buy a jump rope that will last you for years and deliver a great workout. You can jump rope indoors or outdoors and just about any time you like. No need to wait for the gym to open. Jump rope is a massive calorie burner – that’s why boxer’s use it to help them lose weight before a fight. As a weight bearing activity, jumping rope will strengthen your bones as well as your leg muscles, heart and lungs. This can reduce your risk of suffering osteoporosis. Once you have mastered the basics, you can do lots of cool jump rope tricks to make your workouts fun and varied. Jumping rope develops eye/ hand/ foot coordination, so can help improve your performance in other sports. Although it looks like a lower body exercise, jumping rope is actually a full body workout. You’ll soon feel your shoulders, arms and upper back working along with your legs. As a high impact activity, jumping rope can be hard on your feet, ankles, knees and hips. This means that heavier exercisers may find jumping rope uncomfortable. The skill of jump rope can take a while to develop. You’ll need plenty of space to jump rope – in front, behind and above. A fast-turning rope rope can be quite destructive so keep anything fragile out of the way. Types of jump rope – there are lots of different types of jump rope you can buy. Some are made of leather, others are plastic and others still are metal wire. Plain old cotton ropes are usually too slow so choose a “speed rope” instead. Speed ropes have the potential to be very fast, they have light handles, are generally adjustable and they spin smoothly and easily without snagging. Length of your rope – stand on the middle of your jump rope and pull the handles up to your arm pits. A properly-sized rope should just reach your pits. If your rope is too long, tie knots in it to shorten it or reduce the length at the handles. If the rope is too short, get a longer one, as you’ll just end up tripping all the time. Shoes – as a high impact activity, jumping rope puts a lot of stress on your feet and ankles so wear supportive, shock absorbing shoes when you jump rope. Running shoes or cross trainers are ideal. Flooring – if possible, do your jump rope workouts on a forgiving surface and avoid concrete and cement floors. A wooden floor, matted floor or boxing ring is ideal. If you have to jump rope on concrete, make sure your shoes are up to the job and keep your workouts relatively brief and infrequent. With a handle in each hand, stand with your rope behind you and your feet together. Your hands should be around hip-height. With a flick of your wrists, circle the rope up and over your head. As the rope approaches your feet, jump up and over. Don’t jump too high – aim to only just clear the rope. Keeping your knees high, pump your legs and spin your rope as fast as you can! Cross overs are a cool-looking move and also give your shoulders a brief rest. As the rope passes under you, hunch your shoulders and cross your hands in front of your hips. This creates a loop in the rope. Jump though the loop and quickly uncross your hands and return to normal rope jumping. If you are really fast you can do a double under cross over where you cross your hands as the rope passes under you the second time! Jump rope for three minutes, rest for one minute and repeat. This is a good way to break up long jump rope workouts. Do ten jump rope turns and then take a brief rest. Then do twenty and rest again. Keep adding ten more turns until you get up to one hundred. Then go back down doing ninety, eighty and so on until you get back to ten. On completion, you’ll have done 1000 rope turns. Do ten burpees and then jump rope 50 times. Do nine burpees and jump rope again 50 times. Keep doing one less burpee until you get all the way down to one. Make sure you jump rope as fast as you can as this workout is against the clock. By mixing these techniques together, you can create a fun and varied workout that will be different each time you do it. There is no need to ever get bored jumping rope!